Working pressure 125 psi (1 bar = 14.5 psi = 1.02 Kgf/cm2 ). Please use high precision tubing. Make sure the tube to be inserted is cut vertically. Any slanted cut may affect the seal and lead to leakage problems. 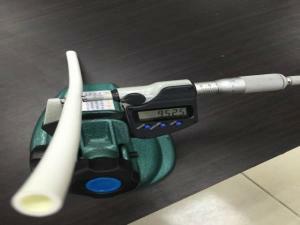 The surface of the inserted tube should be smooth without axial scratches. Cut off any scratched end vertically. If metal tubing is used, make sure the end of the tube is smooth without any burrs to avoid damages to the O-ring. When connecting a tube, occasionally the tube may be clamped as it passes through the O-ring. Make sure to push the tube firmly into the body of the fitting. Failure to fully seat the tube into the fitting may cause leakage. Do not over-tighten threaded fittings. Over-torque may damage the fitting and cause leakage or other problems. When the quick spigot and the tube are connected, a gripper ring may be added if necessary. 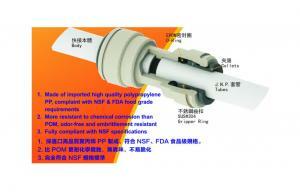 Check if the tube is fully secured by pulling it outwards with moderate force. Avoid excessive shaking, rotation, stretch, bending, or knocking of the quick fitting. This may cause damage to the fitting, or dislocation and distortion of the collets. 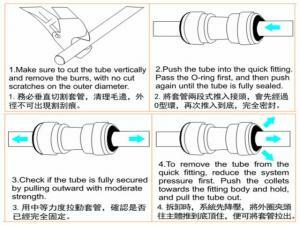 To remove the tube from the quick fitting, reduce the system pressure first. Push the collets towards the fitting body and hold, and pull the tube out. Remove the gripper ring (if any) first before disconnecting the tube. 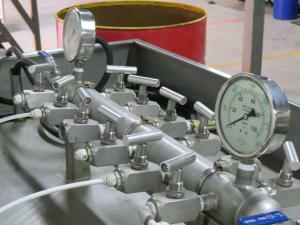 JNP quick fitting is designed to be used with water, foods and beverages. It is not recommended for other uses. Application with chemical liquids must be tested carefully. Please contact us for more information on testing for additional usages.